After I told some friends about my great experiences at the Southampton Writers Conference, where I got to take a workshop with Billy Collins, I got puzzled responses from some people who aren’t typical poetry consumers. They were curious to know how anyone could teach you to write better poetry. Igor Stravinsky once said that, if he were to create a textbook on orchestration, he would have to use only examples from his own music, because those would be the only ones where he could tell if the orchestration was successful. Similarly, my poetry is the work I am most intimately acquainted with. whose husband died so young. Then she was better again. Next summer you can help, she said. Then I didn’t see her for a while. five or six at a time. Some of the people wear badges. They rush through the light snow. they want to answer questions. The last stanza, though, did not convey what I wanted it to. The image the readers got, except for one person who understood my intentions, was of emergency workers coming to help with a desperate situation. That wasn’t my intention, and it didn’t make sense in the context of the poem either. I explained that what I wanted to convey was my experience of seeing these people across the street and realizing that they were hospice workers and that my friendly neighbor was dying. The first detail I got objections to was “five or six at a time.” I had actually seen that many at once, but truth in itself doesn’t justify its inclusion in a poem. Fewer cars was the recommendation. The badges didn’t compute for most people. They didn’t understand I had meant to indicate name tags that medical workers wear. And the detail of rushing through the snow, even though the people had actually rushed–probably just to get through the snow faster–contributed to the impression of an emergency. Collins’s remark, one he made many times during the course of the workshop, was that there were too many cards left face down on the table. It surprised me at first, since I aim at a plainspoken style without obscurity. But I realized that obscurity isn’t only a problem of language. In this case, it was a problem of the selection of detail, which had been so much more successful earlier on in the poem. two or three at a time. wear name badges on cords. They trudge through the light snow. This version, I think, gives the reader a serious chance to understand my intentions, and to share in a small way the experience of discovery. If I find out there are other places in the poem which obstruct that experience, I’ll be revising again. Incidentally, I recommend Ted Kooser’s Poetry Home Repair Manual, among numerous fine books on the writing of poetry. The story of my last decade is mostly the story of my wife Tara’s illness. In 2003, after a couple of months of mysterious symptoms, Tara was diagnosed with ovarian cancer and had a hysterectomy. The cancer was very early, stage 1C, and the surgeon told us that many doctors would not have recommended any follow-up treatment. He strongly advocated chemotherapy and talked us into it. Halfway through her course of chemo, which lasted 4 months, Tara started having trouble writing (her profession for almost 50 years!) and with short-term memory. About that time the surgeon left his position at the hospital and Tara was sent to another hospital to complete her chemo, where she received no supervision and almost no attention. When she complained about the memory problems, she was told she probably had chemo-brain and it would eventually go away by itself. It didn’t go away. After five years of attempted treatments and diagnoses, we finally wound up at Columbia-Presbyterian in New York, where a neurologist specializing in memory disorders sent her for some high-tech tests. When he showed us the results, they demonstrated extensive brain damage. He theorized it had been caused by an opportunistic infection suffered while the chemo was suppressing her immune system. There was no possible cure or treatment, he said. She was still able to care for herself to some extent, and when my father was dying in February 2008 I was able to travel to Albuquerque for a few days. But her continuing difficulties forced me to close down my mail order business in October, 2008, and to sell the house I was using to run the business out of. I’ve only been able to do small amounts of part-time work since then. I still publish a few CDs (one DVD), sell some used CDs through Amazon, and do a little writing including my Woodstock Times column, now ongoing for more than 35 years. During 2008, I learned of a treatment called neurofeedback which was offered by Dr. Steve Larsen in Tillson. I took Tara to him twice weekly for eight months, and she had a brief period of serious improvement. A neurologist she saw both before and after the treatments started said he had never seen such remarkable improvement in someone with her condition in so short a time. But by the end of the year the treatments had stopped working and we ended them. We had another try with Larsen in 2010 combined with a woman he recommended named Barbara Dean Schacker, who has developed some effective treatments for stroke recovery. We tried them because strokes cause similar damage to what Tara had suffered. They had some beneficial effects too. We also went for some months to a speech pathologist for something called cognitive therapy. Both of these caused some short-term minor improvements, but they each stopped having any effect. By the beginning of 2012, in consultation with all the therapists involved, I decided to stop all treatments, all of which Tara had come to dislike, and simply focus on her comfort. I had started writing poetry in 1999, as a result of a series of nightmares. I’m still not sure why they inspired me to write poems, a completely new activity for me unless you count the song lyrics I wrote in the ’80s. (I don’t.) But I had some success, and a lot of encouragement from Tara and from a wonderful local poet named J.J. Clarke, who took me under his wing because he’d enjoyed my radio programs. Caring for Tara, who has now deteriorated to the point where she can’t remember my name or tell you hers, has probably been the most difficult task of my life, despite my having cared for my two dying children decades ago. It’s a lot more exhausting than it is ennobling. But there is at least some satisfaction in knowing that I am providing for this splendid woman the care she needs after more than two decades of the way she glorified my life. And I’m arranging for more time to myself so that I can write and do other satisfying things. 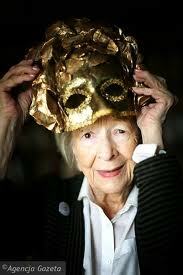 The great Polish poet Wisława Szymborska died last week at the age of 88. You can learn a great deal about my own taste in poetry, and ambitions for my own work, when I mention that she was one of my favorite poets ever. Since Szymborska dealt so profoundly with the life of ordinary things, I’ll start off by telling you how to say her name correctly. That funny symbol of the L with the line through it, which I believe may be unique to the Polish language, is pronounced like a W in English. The W in Polish, as in some other languages, is our V. So her name is pronounced vis-WA-va shim-BOR-ska. Collins is a profound fellow, despite the conversational nature of his prose and poetry, and he has given a good definition of poetry here, at least poetry as I conceive of it: “realms that lie just beyond the boundaries of speech.” That’s why I cannot summarize one of Szymborska’s poems–not only because they are so concise, but because in their selection of images, their unconventional thoughts, and their precise expression, they are indeed beyond the boundaries of speech. That paradox–using words to express what lies beyond words–is the nature of great poetry. Szymborska travels in that land very often, and in moving and surprising ways. And although I read her only in translation, I feel that I do understand what she is getting at. The concepts come across. Although half of “Monologue of a Dog” is wasted on us because it includes the Polish originals of the poems as well as translations, I still recommend it as an introduction to her work. If you want to see how this modest woman, working in obscurity as an editor at a Polish literary magazine, developed her unique voice, you can get either of the earlier English language collections, “Poems New and Collected” or “View with a Grain of Sand.” Both volumes include a lot more poems than “Monologue of a Dog,” and both include many examples of the work Szymborska did–including much rhyming verse–on her way to mastery. But “Monologue of a Dog” is all masterpieces. It includes the great title poem, which shows how the choice of a limited perspective (a dog’s) on human activity illuminates human experience; “A Few Words on the Soul,” as amusing as it is a profound exploration of human nature; and the heartrending “Photograph from September 11,” in which a few words recreate the awful experience of that day with the most beautiful compassion and sorrow. These poems are magic tricks as much as they are explorations of the experiences we share. If you don’t know this magnificent poet, even if you are usually not a poetry consumer, take a few minutes to read some of her work. These poems may not change your life the way they have mine, but the will put you in touch with one of the most beautiful people ever to walk our planet.